There's little doubt that the product of the moment is the iPod. You see the tell-tale white earphones of this MP3 player everywhere and it was the must-have Christmas present. 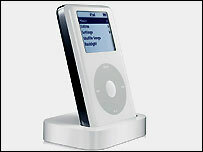 The iPod is the latest hugely profitable product from one of the world's most successful companies, Apple Computer. To enter the Apple store in Manhattan is to enter a temple. Beneath its high vault, swish thin young men and women dressed from head to foot in black. They hold objects in their hands, strange white and silver objects, objects of devotion which they present to lay visitors, to the uninitiated who wander in from Prince Street seeking retail solace. At the top of a set of broad stairs in the sun-lit store is an auditorium, a circle of seats much like those in a chapel, where one of the black-clad priests stands and delivers an encomium to the objects. There is reverence and a sense of being part of a movement. Part of a cult, in fact - the cult of Mac. Devotees of the products from the stylish, small iPod that holds music to the sleek Powerbook computers seem like a tribe. They acknowledge each other, much in the way that drivers of VW beetles used to in the 1960s, as though they alone possess some secret insight. There are people who shave their heads in the shape of the Apple symbol. There are Apple tattoos. There is a website created by one John Charlton who travels the world, photographing himself holding his old, now discontinued Apple gizmo in front of various land-marks from Florida to Munich to Lisbon. Perhaps, many of you who use the rival Microsoft computer system will feel as though you are stalked by zealous colleagues keen to convert you from your foolish ways to the higher virtues of Mac. It all stems from the top. Every year, the chief executive and founder of Apple Computer, Steve Jobs, addresses the faithful in what's known as MacWorld in San Francisco and then, soon in Boston. He too wears a black sweater and presents his objects to the followers. Now, there's no doubt Apple products are very good and it's not just a triumph of style, though style is clearly important, but, it seems to me, at least, that these gatherings do exude smugness. But there is a global sociological phenomenon going on - to do perhaps with a minority who believe they have seen a truth. I suppose there may also be a type of person who delights in going against the herd. Whatever is fashionable for the masses becomes unfashionable for the minority. Manchester City and the New York Mets both have their loyal followers who would rather die than head for Old Trafford or Yankee Stadium. And so it is with Microsoft and Apple. While the big company, Microsoft, dominates the market with its un-cool product, Macs offer an alternative to those with a streak of bolshiness and perversity (both nouns, by the way, are compliments). The Italian philosopher, Umberto Eco, once wrote, tongue only partly in cheek, that Macintosh is Catholic while Microsoft computers are Protestant. Macs, Umberto Eco opined, were "cheerful, friendly, conciliatory," traits he associated with Catholicism. More to the point, though, their way of operating was different from Microsoft's, giving more guidance to users. Macs would, as Umberto Eco put it, "tell the faithful how they must proceed step by step to reach - if not the Kingdom of Heaven - the moment in which their document is printed". He saw that as like Catholicism, in contrast to the Protestant faith which he thought, like Microsoft computers, would "allow free interpretation of scripture, demand difficult personal decisions... And take for granted that not all can reach salvation. To make the system work you need to interpret the program yourself". Maybe, I can sort of see what the great man was getting at. I once wrote something along these lines and got an e-mail back from the treasured actor and author, Stephen Fry, who said he bought his first Mac in 1984 which he claims was the third ever sold in Europe. Douglas Adams who wrote the "Hitch-hiker's Guide to the Galaxy" bought the first two apparently. "While I wouldn't call myself exactly Romish, I think the old fox has a point." I think he had a point too. To watch the throng at the Apple store in Manhattan is to witness an amazing business phenomenon. A company has managed to turn its product into an object of adoration, into something people want to buy whether they need it or not, something they want to buy as something that defines themselves. And that is very good business indeed. 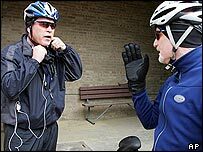 From Our Own Correspondent was broadcast on Thursday, 21 April, 2005 at 1100 BST on BBC Radio 4. Please check the programme schedules for World Service transmission times.